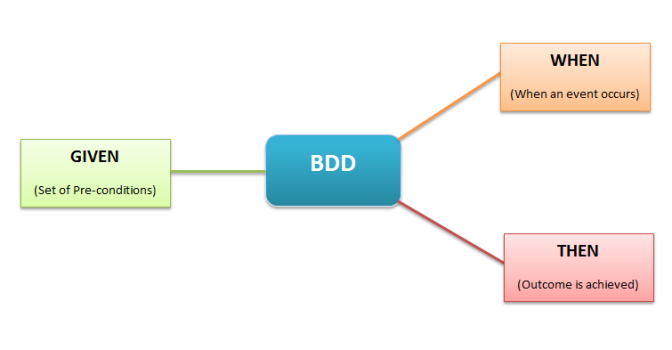 I am trying to implement the best practices of BDD in my company, it’s quite hard because most of them are developers and they have their own way to think which is different for Business and QA professionals. Other day I was discussing with a guy who had read a post about BDD and suddenly he entitled himself as an expert ! Really, this is the most common attitude you will find in IT atmosphere. So, the structure is exactly like this and some people like to write the Given step in the past, but this is the thing, you don’t really need to write the first step in the past, some cases you can write in the present tense. Except the Given that you can choose what is the best option for your scenarios, the When and Then you need to follow the right tenses, When in present Tense and Then in the future tense. The features must have .feature as the extension of the file and you need put the features in the correct path, if you don’t do that Cucumber won’t work. If you want to run with Jbehave you don’t need follow the right structure, you can change this on the pom file if you are using Maven. Some people don’t like to keep them on git with the project, they would like to see the scenarios on JIRA, but you will need to update and maintain in both of the places, for this reason I always put on github. Scenarios should be independent of one another. This means that each and every scenario is stand-alone and should not refer to or depend on functionalities/conditions in other scenarios. Avoid repetitions! Repetitions or identical steps indicate the need forrefactoring. Refactoring denotes that a scenario should be split into multiple ones while the original meaning is preserved. How many Givens, Whens and Thens (including Ands andButs) should you use? As a rule of thumb, there should be amaximum of 3 to 4 consecutive Givens and Thens. Otherwise this indicates a need for refactoring. Whens should be used very sparingly! Usually only include one When. Generally, favour many simple scenarios over few complex ones. Why do we need to have a QA separated environment ? If QA is using a dev environment, that environment is likely changing. It is hard to control the state of the environment with multiple people working against it. Typically, QA environments mimic more closely production environments than do development environments. This helps ensure functionality is valid in an environment that is more production-like. Developers tend to have lots of tools and things running in their environment that could affect QA validation. You usually setup a separate QA environment, because you want to give the testers an isolated environment on which to test, so that developers and testers can work at the same time. This allows reporting on a common revision so developers know whether particular issues found by testers has already been corrected in the development code. Face the distinct possibility of releasing critical defects to customers because it’s not testing in a real-world environment. The test team won’t see the issues when the environment is not the same because the playing field, so to speak, is not even.